My version of a St. Patty’s Day celebration is this floral arrangement and an attempt at Shepherd’s Pie for dinner later tonight. 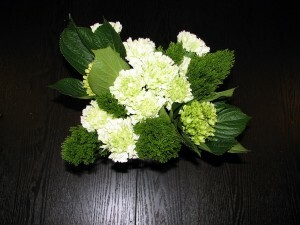 I bought these green carnations, mini hydrangeas, and those leafy green numbers on the left that start with a “T” I think. And I actually made my own arrangement. I like it. I’ve reached the point I reach every year at the end of winter/beginning of spring. I start pretending it’s warm, no matter what the thermometer says. I leave my coat behind, even if I freeze getting from the car to the door. But in my head, spring is coming and I’m done with winter coats. I’m a little better this year because of my bright green coat, which is so much less dreary than a neutral. No matter how fabulous I look in my coat all winter, come March usually I can’t wait to stuff it in storage. Less so this year. So in keeping with the idea of bright color and trying new things (like dressing warmly in March!) I’ve decided to get into St. Patrick’s Day a little. Mostly because I’ve been having a green moment since my wedding and can’t get enough, and also because it gives me a chance to make something in a new cuisine. But that’s as into it as I get; I still think it’s juvenile to run around in green outfits while intoxicated, touting one’s Irishness. I’m part Irish. I’m part a lot of things, but I don’t have special outfits. 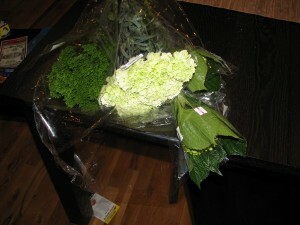 The second picture is of the flowers as I bought them at Whole Foods. Maybe I’ll post later tonight with the results of my Shepherd’s Pie experiment. I’ve never made it before. And maybe I’ll talk Adam into making green cocktails.